Looking for a fun Dr. Seuss snack idea? 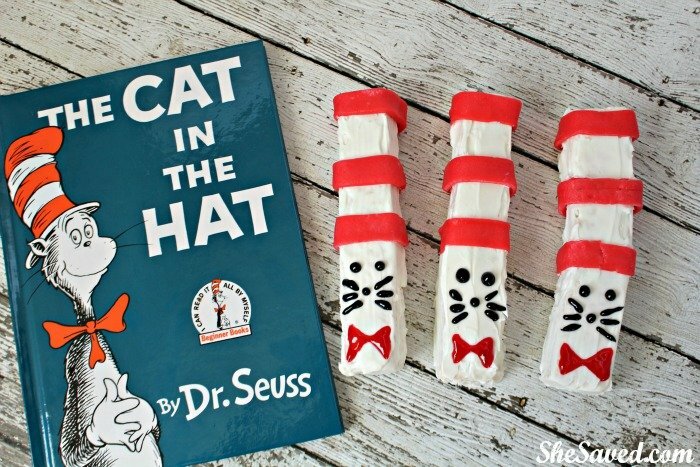 National Read Across America Day (Dr. Seuss Day) is March 2nd, 2016 so I wanted to share these fun Cat in the Hat Treats. Last week I shared my Put Me in the Zoo Rice Krispies Treats, so make sure to check those out as well. You could come up with a whole theme for your Dr. Seuss party! My kids grew up with Dr. Seuss books and of course, Cat in the Hat is the book that everyone knows and loves. I still remember my parents reading this book to me as a child, it truly is timeless and I love how much we celebrate Dr. Seuss and reading in our schools. 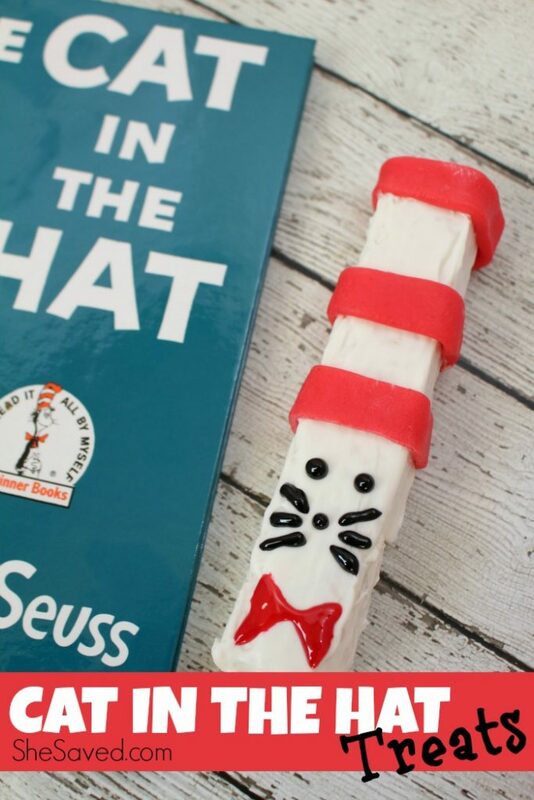 These fun Cat in the Hat treats will be perfect for any celebrations that you might be attending! 1. Spray a 9 x 9 pan with Pam and set aside. 4. Once the marshmallows are melted, remove from the heat and stir in the cereal and optional salt until well-coated. 5. Using a rubber spatula (spray with Pam for easier handling), transfer the cereal mixture to the prepared pan and press down firmly and evenly. 2. Cut the prepared Rice Krispies (from recipe above) into 6 even long rectangles. 2. In a medium microwave-safe bowl, microwave the solid shortening for 40 seconds or until melted. 3. Add the white chocolate melts and stir until completely melted. 4. Immediately coat each Rice Krispies stick with the melted white chocolate and place on the baking sheet to “set” for at least 30 minutes. 5. Meanwhile, cut each Airheads piece into 2 pieces lengthwise. You will have 18 pieces total. 6. Once the chocolate on the Rice Krispies is dry, take an Airhead piece and wrap around a Rice Krispies stick at the very top of the stick. Pinch at the back to seal. 7. Wrap another Airheads piece around the stick about 1/2-1 inch down from the top one. Pinch at the back to seal. 8. Repeat step 7 with another Airheads piece. Complete steps 6-8 until all of the Rice Krispies have 3 airheads pieces alternating with white chocolate for the hat. 9. With the black write-on gel, pipe two eyes, a nose and whiskers on each stick. 10. At the very bottom of each stack, pipe a large “X” with the red write-on gel. Fill it in with the gel to resemble a bow tie. « The Family Handyman Magazine for Only $6.99 per Year! Thank you - I will check out your link up! What a cute way to celebrate Dr. Seuss's birthday! Pinning! These are so cute and a very creative idea! I don't think I've ever seen a treat like this! Thanks for linking up with the Delicious Dishes Recipe party!